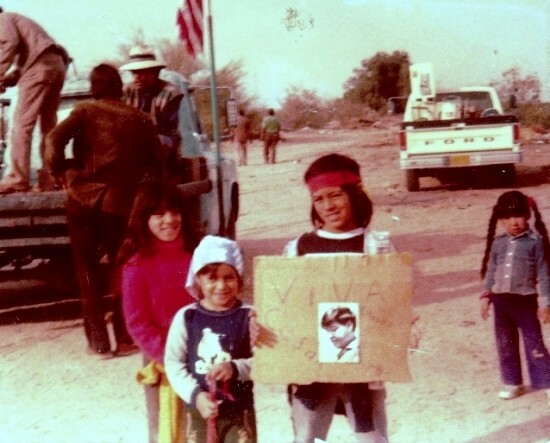 UFW Stories: "When I was a little Girl"
Growing up in Phoenix, AZ. to a family of migrant farmworkers Maria & Juan Ojeda. My grandparents Maria de la Luz & Reyes Garza were one of many of the original union UFW members back in 1960’s in Porterville Ca. which is near Delano and im very proud to say that, because they were loyal to the cause. My brother and I were the eldest in our family so we were my dads crew :) and we worked side by side with our parents working in the green onions he in the west valley of Arizona. I can not say i was ashamed of it, because i have alot of great memories of working out in the fields. I loved the mornings with the fire warming up before work, having our burritos warmed up near the hot coals, those were some of the great tasting burritos ever. In the 70’s here in Arizona there was a big strike and my father was one of Cesar organizers. He was a delegate of the West Phoenix, and every part of the valley had their overseer. I remember the UFW sent men to help organize the people, Compes, Calacas & Humberto, who were stationed here in El Mirage from UFW. they were good friends of my father, my dad is Juan Ojeda “Parra” as most called him and he was loyal to the end of his life and always shared the causa to everyone who came around him. They called someone on the phone, and the guard hung up and said ok, go ahead. My dad knew were he was going…but for us we didnt, it was dark, the road was wooded almost like a forest, and the looked to be like a camp ground of cabins….but as we were driving up, we saw a porch light come on, and door open with a man standing at the door. My parents got down, and got us out the truck…and we came into the house. The man at the door & his wife who greeted us was Cesar & Helen Chavez. They got us comfortable in the living room, some on the sofa, and some on the floor in blankets. I remember looking at my parents from my snuggled spot on the floor….watching my parents having coffee & pan de at the table with Cesar & Helen. I didnt really realize it until i was older that was something great & honor….and I thank God for memories like that, and they’re are many more.